"Babur and His Warriors Visiting the Hindu Temple Gurh Kattri (Kūr Katrī) in Bigram." Digital image. Walters Art Museum. January 11, 2010. Accessed August 21, 2010. http://www.flickr.com/photos/medmss/4266569149/. 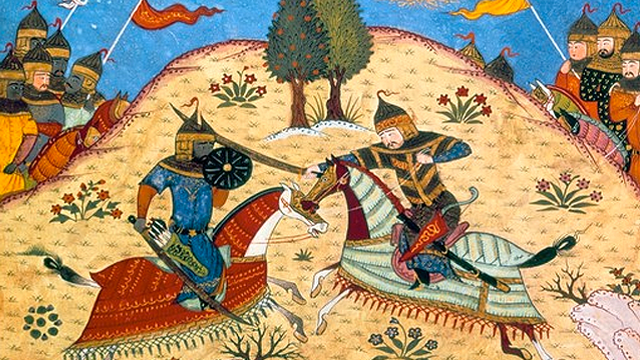 "Battle on Horseback between Rustam and His Son Sohrab, Not Recognizing Each Other." Digital image. The British Museum. Accessed August 21, 2010. Dupree, Nancy. 61-157-C. Dupree Collection, Williams Afghan Media Project, Williams College, Williamstown, MA. Dupree, Nancy. 66-N-72. Dupree Collection, Williams Afghan Media Project, Williams College, Williamstown, MA. Dupree, Nancy. 66-N-73. Dupree Collection, Williams Afghan Media Project, Williams College, Williamstown, MA. Dupree, Nancy. Anahita. 1969. Dupree Collection, Williams Afghan Media Project, Williams College, Williamstown, MA. Mithras and the Bull. Mithraeum of Marino, Marino, Italy. Rashid Al-Din. "Conversion of Ghazan to Islam." Digital image. Asia Society. August 19, 2008. Accessed August 21, 2010. http://asiasociety.org/countries-history/traditions/mongol-illustrated-manuscripts. Schastok, Horst B. No Gumbad Mosque. Documentation Center, Aga Khan Program for Islamic Architecture, Fine Arts Library, Harvard College Library, Cambridge, MA. "Seated Buddha." Digital image. Virtual Collection of Masterpieces. Accessed August 21, 2010. http://masterpieces.asemus.museum/masterpieces.aspx. Sultan Mahmud of Ghazni (Mahmud Ghaznawi). Copied from Old School Textbook of Afghanistan, Unknown. Ustad Mohammad Omar. Untitled performance. Radio-Television Afghanistan Archive. Many of the world’s great religions have a history in Afghanistan. The traders, travelers, and conquerors who came to the region brought not only new goods and new ideas, but also new beliefs and new faith. But history doesn’t change overnight. When we’re looking at the Islamic conquest of Central Asia and Afghanistan there’s usually an assumption that if we say a battle was fought at this time and the Arabs won then everyone became Muslim. But if we actually look, and the records are quite clear about this, it was often many generations before they became Islamic. When Iran was converted to Islam, that had an impact on Afghanistan. The people in Afghanistan did not at that point convert immediately to Islam. They retained their traditional language and did not necessarily adopt Arabic as their basic language. In the 7th, 8th, and 9th centuries, Afghanistan religiously was composed of a whole variety of different religious practices and religious beliefs. Zoroastrianism, Mythriism, to a limited extent Buddhism, and to a limited extent Islam. This whole region became a place where people fled. So we had Nestorian Christians who had fled from Syria and were living in this part of the world. We certainly had various Indian sects that came up to this part of the world. Hindus lived here. And what makes Afghanistan such a melting pot – and why art is so interesting – is it shows us many of these different ideas coming together. Muslims came to Afghanistan, individually or in small numbers, beginning in the eighth century. But only in the tenth century with Mahmud of Ghazna is the area really conquered in the name of Islam, and many people start to convert. We’re often not clear about how long it takes a political change to turn itself into a cultural change or a religious change. These things are often describe retrospectively and may have been much less clear at the time they actually happened. The turning points of history do not always have immediate and widespread repercussions. Although Islam would take root and become the primary religion of Afghanistan today, the diverse religious traditions of this crossroads region persisted alongside the new faith for many centuries. One hundred years after the Prophet's death, Islam spread quickly—and it took hold permanently.